"I'm going home to an old country farmhouse, once green, rather faded now, set among leafless apple orchards. There is a brook below and a December fir wood beyond, where I've heard harps swept by the fingers of rain and wind. There is a pond nearby that will be gray and brooding now. There will be two oldish ladies in the house, one tall and thin, one short and fat; and there will be two twins, one a perfect model, the other what Mrs. Lynde calls a 'holy terror.' There will be a little room upstairs over the porch, where old dreams hang thick, and a big, fat, glorious feather bed which will almost seem the height of luxury after a boardinghouse mattress. How do you like my picture, Phil?" "It seems a very dull one," said Phil, with a grimace. "Oh, but I've left out the transforming thing," said Anne softly. "There'll be love there, Phil—faithful, tender love, such as I'll never find anywhere else in the world—love that's waiting for me. That makes my picture a masterpiece, doesn't it, even if the colors are not very brilliant?" The timing of this has been rather fortuitous. Just as I decide that I really do need to do some decluttering, my friend Kaylie puts me in mind of Anne-with-an-'e'. I've been re-reading Anne of Green Gables (free ebook available here) and thinking about the place. Particularly reading the later books when she goes away and comes back to visit, you really get a sense that Green Gables is a very simple, in some senses sparse, house - but filled with love and beautiful memories. I think I might even go so far as to say that Green Gables symbolises what I want my home to be. 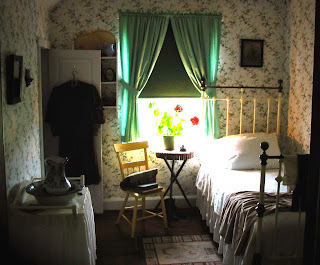 As I am moving about my house these days, I am trying to keep 'my Green Gables' in mind. Not necessarily Green Gables itself - after all, technology and life has changed since then and it is not likely that I am going to switch from using a shower to using a washstand - but to keep that ideal in mind of a home that is outwardly simple and inwardly rich, in which each item has meaning and function. This has been very useful and helpful as I go about my decluttering. I find myself looking at something and think - well, it's not really in the way. There are only two items left on that shelf. And it's quite pretty. And a friend gave it to me. But then I ask myself - if I were setting out to construct and furnish my own Green Gables, would I include it? If the answer is no, then there is no place for it in my home. It's quite a handy trick, I find - embracing all the concerns about keeping practical things that improve life, beautiful things that enrich life, and tokens from special moments and special people - and letting go of the rest. If I would feel comfortable putting it in Green Gables, I know it has a place in my home.